From its humble beginnings some ten years ago, peer-2-peer file sharing has evolved in leaps and bounds, with the majority of Internet traffic now focused on the “torrent” protocol. Torrent clients are now so advanced that they don’t even need a centralised tracker anymore – just give them a torrent and they can seek out peers themselves. The latest iteration of the two most popular torrent clients also allow for remote control – so let’s see today how to make use of the remote control functionality from your mobile phone as a mobile torrent client. Although I will show how to access this from your mobile, we will also be covering access from other PCs along the way. A modern torrent client. I recommend uTorrent for Windows, and Transmission for Mac. An iPhone or Android mobile, or at least a phone capable of full Internet browsing. Firstly, make sure you are using the latest uTorrent. At this time, it’s 2.2. You can check from Help -> Check for Updates. Open up the Options -> Preferences menu (or press Ctrl-P). From the sidebar, select Web UI, then tick the box to Enable Web UI, set a password and username, and I’d also suggest changing the default port number. In this case I’ve made it 9091. To access your torrent client from another computer on the local network, you need only type your IP address, then a colon and the port number, and /gui/. 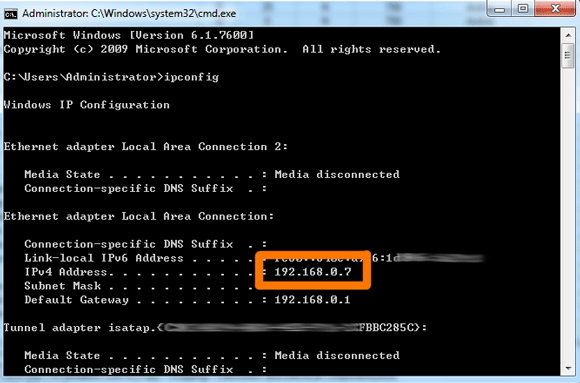 The easiest way to find your IP address is to click Start, type CMD, then hit Enter. A command line window should open, type IPCONFIG and hit Enter again. Look for the line that says IPv4 address. Here I can see that my IP is 192.168.0.7, so from another computer, I type in http://192.168.0.7:9091/gui/ to access the web interface. With Transmission installed and open, select Preferences from the menu, and open the Remote tab. Tick the box to Enable Remote Access, and enable authentication. Note down or remember the port number you specified. Close the preferences to save your settings. As a quick test, hop over to another computer and type in the IP address of your torrent machine, followed by a colon and the port number you wrote down from the preferences screen. 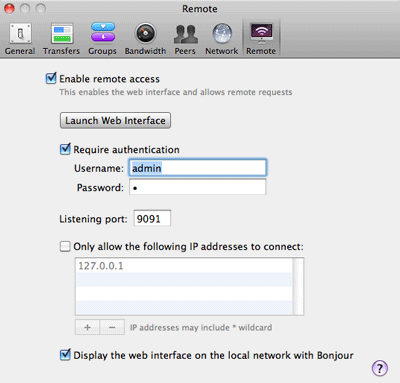 If you don’t know your IP address, the easiest way to to find out is to open the Network section of System Preferences. Here you can see my IP address is 192.168.0.5. In order to access your torrent client remote control page from outside of your local (home) network, you’ll need to set up your router to forward the relevant requests to your local PC. Your router will have a separate IP address with which it communicates to the outside world – so we need to link the two together. We will make it so that any requests it receives on port 9091, it will send to your local PC so it can respond with the torrent web interface. Load up your router interface – try this link for the most common setup -> http://192.168.0.1, but you’ll need the admin password from your router documentation. 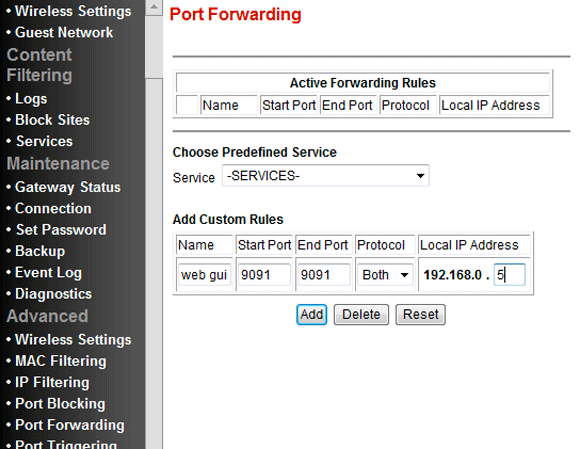 Start Port and End Port: Since I only need to forward one port, I entered 9091 for both start and end. Protocol: Set this to both just to be sure. Local IP address: This should be the IP of your torrent machine which you noted down earlier. Some interfaces will require you to type in the full four sections of the IP – mine just needs the last number. Next, figure out your external IP address. The easiest way is to visit this page and copy the number there. To quickly test if it’s working, turn the Wifi network on your iPhone or Android off – this will force it to use 3G. Type in http://(your external IP):9091 (or the port you chose), and don’t forget to include the trailing /gui/ if you’re using uTorrent. To remove the address bar and create an icon for your torrent manager, just use Safari’s + > Add to Homescreen function. Both uTorrent and Transmission web GUIs come with a handy upload or open button. Just copy the URL of the torrent you want to download, open up your torrent manager on your phone, hit Open, and paste in the URL. Note: Using the Transmission interface straight in mobile Safari caused a few problems for me, where the keyboard would disappear immediately and I couldn’t paste the URL in. To solve this, add the GUI as a homescreen app using the method I described above. If you have any problems with the mobile torrent client tutorial, let me know in the comments and I’ll do my best to help (please don’t ask me about Android phones though – you might want to try the Answers site to harness the power of fellow readers and editors).